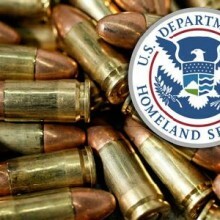 DHS has stockpiled 1.6 billion rounds of ammo. The National Weather Service and Social Security Administration have a couple of hundred thousands rounds each. Add to this millions of MREs, body armor, and several thousand medium armored vehicles. Looks like they are preparing for war, but they are domestic agencies, right? By the way, the ammo consists of hollow point and sniper rounds, no exactly target rounds.